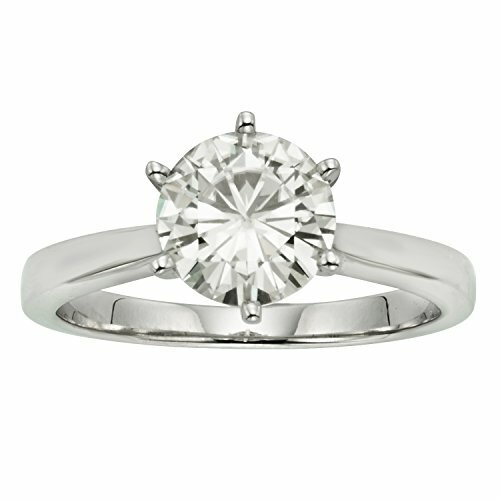 This gorgeous Forever Classic solitaire engagement ring showcases a 6.0mm round brilliant cut moissanite gemstone. Beautifully crafted in rhodium plated sterling silver and secured in a six prong setting. Ring size 8. The Total Diamond Equivalent Weight (DEW) is 0.80ct (Actual Weight 0.68ct). Charles & Colvard Forever ClassicTM moissanite takes your breath away with its dazzling sparkle. This incredible gem has the faintest hints of color (J - K color range), just enough to lend definition to its facets. Forever ClassicTM is the perfect companion gem for a wide variety of jewelry styles. Charles & Colvard Forever Classic moissanite takes your breath away with its dazzling sparkle. This incredible gem has the faintest hints of color (J - K color range), just enough to lend definition to its facets. Forever Classic is the perfect companion gem for a wide variety of jewelry styles.